Distinct chromosomal locations of intact HIV-1 proviruses in study participant 1. (A and B) Circos plots highlighting ATAC-Seq and RNA-Seq reads in proximity (ATAC-Seq: ±8000 bp; RNA-Seq: ±5000 bp) to integration sites of intact and defective HIV-1 proviruses. (C) Combined individual-value/box-and-whisker plots indicating the chromosomal distance between HIV-1 integration sites and the most proximal TSS listed in Ensembl v86 (databank), or identified through analysis of expressed RNA species located within the boundaries of the host gene, using autologous RNA-Seq data from the indicated cell populations and limiting the analysis to proviruses integrated in expressed genes. 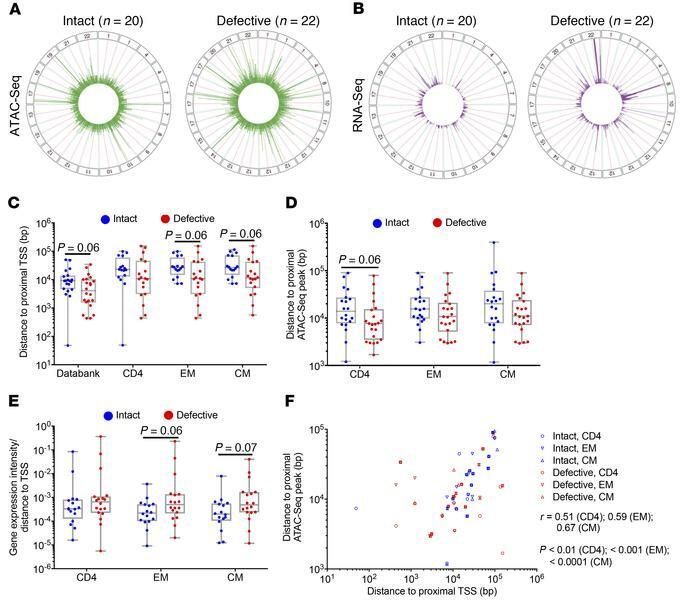 (D) Combined individual-value/box-and-whisker plots showing the chromosomal distance between integration sites and the center of the most proximal ATAC-Seq peaks in indicated CD4+ T cell populations. (E) Gene expression intensity of host genes harboring intact or defective proviral integration sites, normalized to the chromosomal distance between integration sites and the most proximal TSSs determined using autologous RNA-Seq data as described in C. In C–E, boxes and whiskers represent median, 25% and 75% percentiles, and minimum/maximum levels. Significance was calculated using 2-tailed Mann Whitney U tests; nominal P values are reported. (F) Distance between each integration site and most proximal TSS, plotted against corresponding distance between each integration site and the center of the nearest ATAC-Seq peak. Spearman’s correlation coefficients are shown for each cell population. In A–F, clonal sequences were shown/counted only once. EM, effector memory; CM, central memory.